Wake to morning birdsong in a cosy clean two bedroom cottage on a lifestyle block nestled at the foothills of the Waitakere ranges. Kids can explore and meet the local wildlife (supervised at all time of course) before you head out for an adventure. The perfect springboard for exploring the wonderful West Coast with it's wineries, shopping centres and natural wonders. Beautiful surf beaches, magnificent waterfalls, native bush and stunning lakes are all within minutes of Palm Cottage. ~Covered fenced off deck for outdoor relaxing and dining and space for the little one to keep safe and play. Has a large fully fenced deck to keep small children safe however older children will need to be supervised while exploring as this is a lifestyle property. Smoking allowed outside only, please don't throw butts on the ground. Remove shoes before going inside as we have chickens that free range and you may stand in a poop. Second bedroom is cosy when both trundler beds are being used otherwise it is roomy if only one bed is being used. We have lived out west for most of our lives we love the area with its black sand beaches and the Waitakere ranges with the beautiful fauna and bird life.We know and love the west and are happy to provide guests with information and help in any way to make your stay one to remember for all the right reasons. We are so close to all amenities that you will have plenty to see and do. We have plenty of brochure's for the many activities close by. Our cottage is fully equipped with everything you should need it has quality furnishings and décor everything is extremely clean with quality beds. The surrounds and views from the windows are peaceful and green with lots of birdlife for you to enjoy with a covered fenced off deck. Bathroom is suitable for disabled as it is open plan with grab rails and fold down seat in shower. Just check before booking that the doorway is wide enough for your wheelchair. Rural lifestyle block with chickens, peacock and pony. Lovely gardens with walking tracks fresh air and lots of birdlife. Very tranquil peaceful setting yet close to all amenities. Plenty of clean linen, pillows, sheets and blankets. Plenty of parking at the door. We are on rural broadband but not unlimited so we ask that you do not stream movies. Has all the basics a selection of tea and coffee. sugar, including a few extras. Fully equipped with stove , microwave and fridge freezer with plenty of crockery and glasses. With a selection of CDs. With a selection of DVDs. We have a few books. For the little ones, DVDs and books and toys however we only have children stay with parents that have good reviews due to the damage caused in the past. With a selection of videos. We have a big garden and plenty of walking tracks which you are welcome to wander but remember to bring suitable foot wear as they are mostly grass or stones and can be slippery in winter. A large covered fully fenced deck with table and chairs for out door living. Redwood Park golf club is a 4 minutes drive. Only one bedroom has enough room for a wheelchair so need to contact me to discuss how many guests are staying and what sleeping arrangements are needed before confirming the booking as it may not be suitable. The kitchen is to small for a wheelchair but bathroom is fine. West wave is a heated indoor pool with diving boards and waves it has a water slide with spas pools and a sauna and a gym which is located in Henderson approximately a 10 minute drive. Close to golf clubs, theme park, rain forest walks, black sand beaches, hot pools and recreation centre, equestrian centre, cafes, theatre, boutique winery's, restaurants, wedding venues and more. Our visit could not have been nicer. The spotless cottage is beautifully designed for air flow and sound sleep, the porch perfect for sitting. We were gifted eggs and veggies by the loveliest proprietors. Eight acres of land surrounds you for walking. Owners were very friendly and helpful and supplied us with fresh eggs from the free range chooks. Beautiful, peaceful property. Great place to unwind. Friendly, hospitable hosts. Thanks Carol, I'm glad you enjoyed your stay your welcome back anytime. This was a perfect place to stay after a long flight from England. Only 40 mins from the airport. Lovely and clean with all that was needed for our 3 night stay. We could completely relax and recover. Great hosts and we would not hesitate to stay again. Thank you Janet we are glad you enjoyed your stay with us it was a pleasure to meet you and your family and we hope to see you again in the future, happy travels. Donna and Michael were the perfect hosts: available for questions and providing quick and concise answers, but left us on our own otherwise. The property was very well appointed. There was nothing that we wanted that wasn’t there. It was very clean and comfortable. While the rural setting was fantastic (how many places in the world can you have unscreened windows and doors wide open all night while feeling totally secure AND be untroubled by insects!?!? ), it was a two minute drive to the Swanson Train Station and a 50 minute ride to the Auckland Harbour. The peaceful setting more than compensated for the “lost” time. In addition there was no driving stress nor parking problems. The property was *outstanding* value. On a scale of 1 to 5, this would earn a 7! We would make this our first choice when returning to the Auckland area. 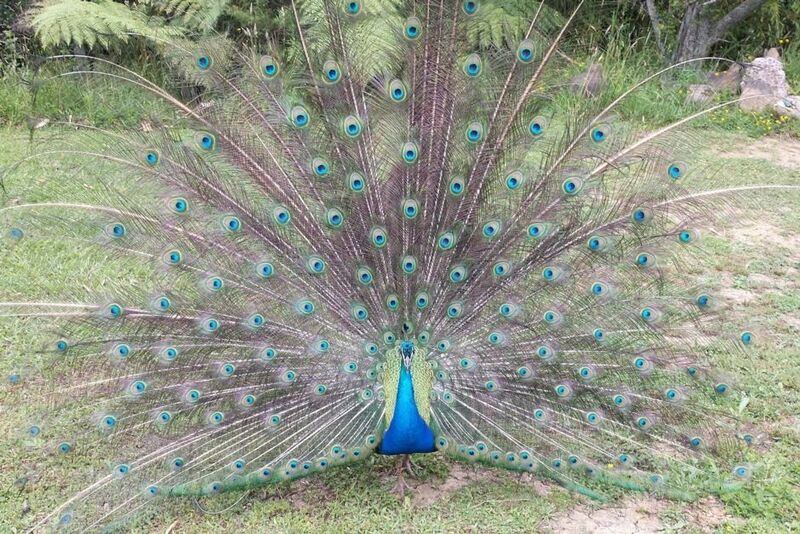 And, yes, the peacock did display every morning and evening! Kenneth and Betsy were the perfect guest's and it was a pleasure to have them stay. We are glad they enjoyed themselves and were happy with everything and thank them for the wonderful review. They left the cottage lovely and clean and we would highly recommend them and hope to see them again. Take care of yourselves and have a wonderful Christmas. We enjoyed hand feeding the beautiful peacock! We are glad you enjoyed your stay and found everything to your liking. It was a pleasure to meet you and we would welcome you back anytime. The perfect springboard for exploring the wonderful West Coast with it's wineries, shopping centres, markets and natural wonders. Beautiful surf beaches, magnificent waterfalls, native bush and stunning lakes are all within minutes of Palm Cottage. Plus so much more.